Ayurvedic resorts in Kerala are plentiful, due to the moist humid climate and abundant supply of medicinal plants and herbs there. Not only can you rejuvenate your body, you can have a wonderful vacation at the same time. However, the treatments at some Ayurvedic resorts are much better than others. These top Kerala Ayurvedic resorts are all well managed, and have an excellent range of properly administered Ayurvedic treatments. To save money, go during the monsoon season (from June to September). The weather is perfect for Ayurveda at that time too! You'll also find some excellent holistic India wellness centers in other states. However, if you have a serious illness, do consider an Ayurvedic hospital as an alternative. Mekosha opened near Trivandrum in early 2018, and brings an notable new concept to India -- in-suite spas and unlimited massages. That's right, you can have as many massages as you want, and you can have them in your room (or anywhere else on the property, for that matter). Each 600 square-foot guest suite has its own adjoining private treatment area, with balcony overlooking the swimming pool and river beyond. As well as traditional Ayurvedic treatments, administered by doctors according to guest requirements, international treatments such as Swedish massage are available. Feel like a foot massage while relaxing by the river? It's possible! Of course, Ayurveda is more than just treatments. It also extends to food. At Mekosha, guests can learn how to cook Ayurvedic cuisine. Local ingredients are used, and there's a communal dining table for guests to chat while eating meals. The experience at Mekosha is designed to be informal and friendly. Cost: Various packages are offered. Rates start from 110 euros ($135/8,800 rupees) per night including all meals and massages, plus yoga and meditation. The ultimate in luxury and pampering, award-winning Carnoustie Ayurveda & Wellness Resort at Marari beach offers holistic treatments that combine Ayurveda, yoga, mantra, and naturopathy. This includes individual Ayurvedic diets for guests. A wide range of programs are available, ranging from detox to healing. Accommodations are provided in opulent villas with private plunge pools. Cost: Rates start from around 20,000 rupees ($300) per night, plus tax. Seven, 14 and 21 day Ayurvedic packages are available, starting from about 265,000 rupees ($4,200) for a double. At Kairali Ayurvedic Healing Village, Ayurvedic treatment is also about getting back to nature. The resort is set on 50 acres of lush land in the Palakkad district of Kerala. There's even a stream running past each cottage! Although it's a resort, Ayurveda is treated seriously there. Only vegetarian food is served, and no alcohol. Guests are also encouraged to participate in early morning mediation and yoga sessions. The resort has its own organic garden, and swimming pool. Cost: Room rates start from around 30,000 rupees ($465) per night for a double, including meals, consultation, one Ayurvedic herbal oil therapy, yoga and meditation. Packages are available for numerous health concerns such as diabetes, arthritis, and chronic back pain. If money is no object, head straight to Kalari Kovilakom -- the palace of the ancient Vengunad Kingdom in Kerala, now converted into a palace for Ayurveda by CGH Group. It's quite out of this world. No meat, leather footwear, or alcohol are allowed at Kalari. There's no TV, or any entertainment for that matter. Hymns are chanted in the evenings. Every therapy is personal and customized, often combined with yoga and other methods to provide deep healing from within and without. Even the food is served according to individual requirements. The aim, according to the resort, is to give guests a chance to start their lives over again and be reborn. Cost: 14 night packages start from around $6,800 for a double. You won't find sea or swimming pool at this very popular Ayurvedic center, surrounded by paddy fields on the outskirts of the Kerala backwaters near Kottayam. It's owned by a family of Ayurvedic doctors whose experience goes back five generations, and is very authentic and traditional with high medical focus. Also notable is that the center has one of only three kutee huts in India, especially constructed for undergoing the ancient Ayurvedic treatment of Kutee Praveshika Rasayana (to build immunity and halt the ageing process). There are 16 guest cottages, sustainably built in traditional Kerala style, plus a guesthouse in the new wing with eight rooms. Cost: Athreya Ayurvedic Centre offers three different treatment packages -- Seven to 13 day Ayurvedic Wellbeing Program, 14 day Detox Program, 30 day Kutee Praveshika Rasayana. Each costs 8,500 rupees per day. Soma Manaltheeram Ayurveda Beach Village is located right by the beach, in front of Somatheeram Ayurvedic Health Resort and Somatheeram Aurveda Resort. It's owned by the same family that introduced the concept of Ayurvedic resorts to India. However, it's a bit less traditional and more modern. Yoga and meditation are offered in addition to Ayurveda. Do note that children under the age of 12 aren't permitted. Cost: Room rates start from about 4,000 rupees ($60) per night, and meals are additional. Various packages are available, starting from around 103,000 rupees ($1,600) for seven nights and two people. If you're on a budget, try escaping to the tranquil Kerala backwaters for your Ayurvedic treatment. The very serene Sarovaram Ayurvedic Health Center is a simple place that's spread over three acres of garden, right on the water's edge near Kollam. Family owned, it's run by third generation Ayurvedic doctors. While there you can enjoy activities such as a houseboat ride along the backwaters, evening dance performance, or visit nearby villages. Cost: Rooms are reasonably priced, with rates starting from around 3,000 rupees ($50) a night, including breakfast. Tailor-made Ayurvedic packages are offered for a minimum of three days. Another affordable option for Ayurvedic treatment in Kerala, the Ideal Ayurvedic Resort is located in Kovalam. It's situated on the edge of a small village within a canopy of coconut palms, five minutes walk from Chowara Beach. 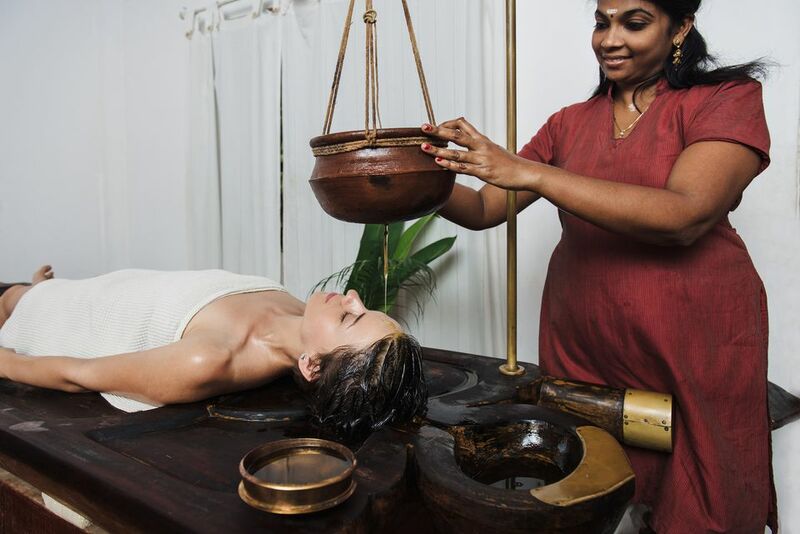 Although not as luxurious as other Ayurvedic resorts, treatment is still of a high standard and is administered by doctors. Yoga and meditation complement the wide range of packages available. Cost: Room, without treatment, start from 1,650 rupees ($25) for a double. 14 day rejuvenation packages start from around $1,700. Located in the lush Wayanad district of Kerala, where nature abounds, the Ayurveda Yoga Villa offers a unique blend of Ayurveda treatment, yoga practice, and training in Kalari marital arts. Guests tend to find the atmosphere really special at this place. There's a temple, cow sanctuary, and organic garden and shop on the premises. Teachers and doctors are properly trained, and the staff very caring. Cost: Seven day packages start from around $1,450 for two people. Also a budget option, Shin Shiva is comfortable and informal, but also extremely professional. The resort was founded by a doctor whose family has a 400 year old tradition in Ayurvedic treatment. It's located on top of a cliff at Chowara, overlooking the ocean and close to Kovalam beach. It's around 30 minutes drive from Trivandrum airport. A wide variety of packages is offered, including de-addiction treatments for habits such as smoking. Cost: Seven day packages start from around $1,500 for two people. Perumbayil Ayurveda Mana is housed in the ancestral property of the aristocratic Perumbayil family, who have been associated with Ayurveda for generations. It's situated in the Guruvayoor region of Thrissur in central Kerala. This center is best suited to those with serious medical conditions, who are willing to forego luxury to benefit from age-old Ayurvedic traditions, administered by senior doctors from Kerala's leading Ayurveda families. Its 20 guest rooms are spread over three categories and two buildings, overlooking a stream. The heritage rooms are located in the 370+ year old ancestral home, while a newly built replica contains the others. Numerous packages are available, ranging from general wellness programs to treatment of specific ailments. Other facilities include a library, herb garden, and yoga room. Cost: From around $1,000 for seven nights, including accommodations, meals and treatments.